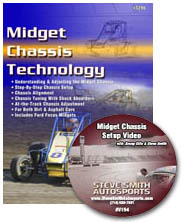 Steve Smith Autosports has been a leading publisher of auto racing technical books and videos for over 35 years. Our books and videos have always been on the cutting edge of technology. Our best-selling publications have helped thousands of racers improve their cars, teams and racing careers in the ever-changing world of auto racing. We pride ourselves on quality service and assistance. Please don't hesitate to place your order on our secure order form and start working towards a brighter racing future today!